Contact: +65 84266224 (Strictly for SMS/Whatsapp is available only. Public Holiday - Strongly by appointments. *Please note, CASH payments only. ♥ A $20 deposit is required to confirm appointment. Transfer to POSB SAVING 065-394-740. Deposit are non-transferrable or refundable for changes/cancellation of appointment that is made 2 days before the appointment. Thank you! ✭ Book your appointment 3 day in advance to avoid any disappointment. ♥ If you wish to cancel or change timing to your appointment, please let me know at least 3 day in advance. ✭ Try not to walk-in, please book your appointment on your preferred date & time is advised. 2 Person (No Pedicure Service). This is to prevent overworking for me as I am working alone. TITLE; Book-ed your appointment with us? Share it around now with your social networks to get 2 FREE NAIL ART CHARMS of your choice!! 1) For Facebook share : Repost & share it with your own words, tag us along & receive your free nail art charms. 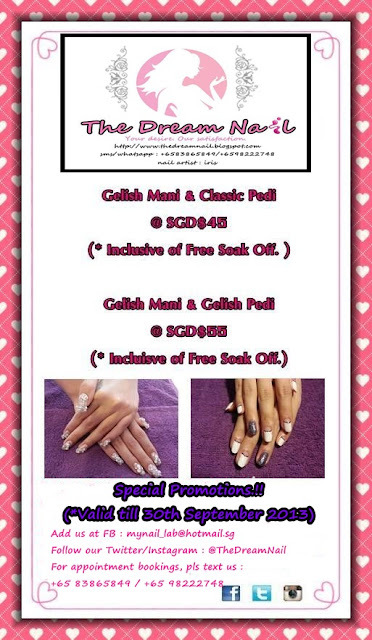 2) For Twitter/Instagram : Repost it with the photo of promotions & tag us along & receive your free nail art charms. 3) For handphone mass SMS/Whatsapp : Boardcast it along with the promotion photo, & screenshots the boardcast box & forward to us & receive your free nail art charms. Easy right? Why wait? It's easy & won't take up alot of your times. & come on don't miss this great deals, book your appointments with us now!!! Used only AngelPro, Perfect Match, Gelly Fit, DGel, Brite & Orly Gel Fx. For more prices or promotions, please SMS/Whatsapp us ONLY @ +65 98222748. Thank you.